Flip Out Mama: Interview With Garen Wolff, author of Galstanberry Girlz! Interview With Garen Wolff, author of Galstanberry Girlz! You guys might have seen the button at the top of my page featuring these lovely ladies, the girls of Galstanberry. Today I'm going to tell you a little more about them. The Galstanberry Girlz book series was created by Garen S. Wolff, and is a refreshing series of books for middle school age girls. It features5 girls, all of different economic backgrounds, different ethnic backgrounds, from different cities. The books deal with growing up and topics like that, but teaches young girls not to be in such a hurry to grow up, to enjoy being a "tween', and stop trying to be one of the crowd. I know all to well the pressures facing young girls today and I am excited to see a book series that goes the other way, instead of encouraging them to grow up so fast. Next month, we will be having a giveaway for the first Galstanberry Girlz book,which just debuted last week! Today, I would like to share with you my exclusive interview with the author, Garen S. Wolff! Q: What was your inspiration behind the book? A:The diversity of girls around the world! Tall, short, red head, brunette, spunky, shy! Infact, while walking down the street, I see no two girls that look alike! Every girl has a story to tell based upon their experiences, geographic location, ethnicity, family structure, etc. Therefore, I wanted to create a series that truly reflected the diversity of girls' voices. Q: What made you choose the cities the girls come from? A: I wanted to choose 5 cities that represented different parts of the United States. From the west coast, the south, east coast, and Midwest, each state has a different type of industry and culture. It was important to recognize this geographic diversity. Q: Why are the girls in the book wearing different shoes? A: The different shoes reflect each girl's personality and most importantly illustrate the theme of the series; girls have unique voices that should be recognized and celebrated. 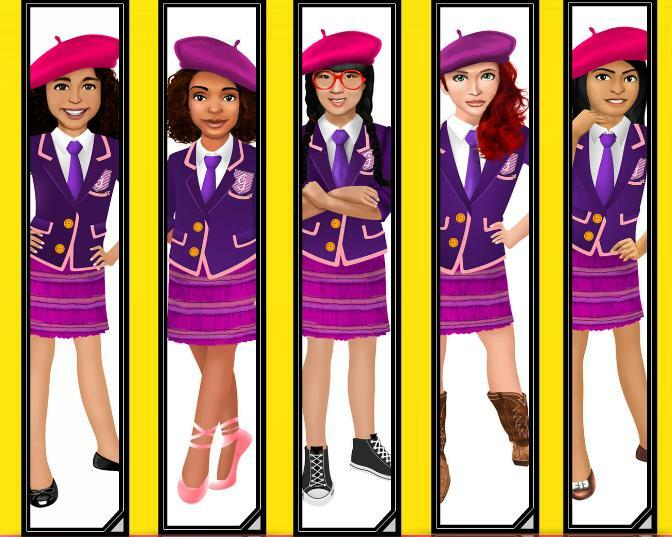 Although the five girls are wearing the same uniform and must follow the rules and traditions of Galstanberry Girls Academy, they never lose their individuality, which is reflected in the different poses, facial expressions, and shoes! Q: Where did "Galstanberry" come from? Ha-a-rvard. The second part of the word came from my sweet tooth. One of my favorite snacks is raspberries. So, when you put the two parts together, you get Galstanberry, pronounced, "Ga-a-lstanberry". A: It took me several months to write The Girlz of Galstanberry; and I wrote EVERYWHERE! Riding the subway, sitting on a bench at the National Mall (I lived in Washington D.C. at the time), waiting in line at the grocery store, and sipping tea in coffee houses! Q: Which Galstanberry girl do you relate to the most? Q: What is your goal of the Galstanberry Girlz books? What do you want people to learn from them? A:The most important message of The Girlz of Galstanberry series, is that girls should embrace and celebrate their unique voices. What do I mean by "voice"? Girls' voices (aka personalities, opinions) are shaped by their cultural background, socio-economic status, friends, family and even geographic location! Therefore, girls shouldn't feel confined to anyone's standard of beauty or "popular status". We are all different and should be celebrated for our uniqueness! A: My favorite part is the integration of cultural nuances, like accents, dialects and native languages. For example, Tabitha's chapter is full of Texan phrases and dialect. Mother is pronounced, "mo-thah", and twenty-five is pronounced, "twenny-fav". In Lillian's chapter, Spanish phrases are used and translated in footnotes. The book has extra flair because of each girl's cultural and geographic differences. Q: Do you have plans for more books in the future? A:Yess!!! The last chapter, "Welcome Home!" is a complete teaser! 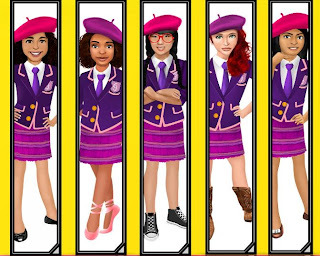 In the next book, readers will find out the girls' roommates, classes, etc. And ofcourse, there will be some dra-ma! I'm TOTALLY excited for it! Q:How can girls become "Galstanberry Ambassadors?" Q:Will you be offering any holiday specials on the website? A: Yes! For a limited time, people can buy 2 books at a time for just 18.50! Just click the Holiday Discount option! Thanks so much, Ms. Wolff, and we are so very excited to be hosting a GG Giveaway next month! Stay tuned for more updates! Great interview with Garen. Love the concept.